It’s Birthday Week on orange, and with it comes a mess of conflicting emotions, much like the holiday itself. We tend to think of birthdays as a celebration of life, marked with parties and packed with presents and frosted goodies, and they often can be. But there’s also an undercurrent of sadness and uncertainty to them, as they’re both a reminder of what’s passed and what might be waiting ahead. Life and death are as intertwined as the past and the future, and orange‘s birthday story line is painfully aware of that. Suwa’s letter from his future self is what sets us down the birthday path. Future Suwa never got to celebrate with Kakeru because he found out about his birthday after it’d already passed, so our current Suwa and Naho work together to make sure that doesn’t happen “again.” Kakeru’s birthday is right around the corner, and the gang is more than willing to put together a last-minute celebration for him. As they plan the party, the question “What do you want?” echoes through each scene, and feeds into one of orange‘s major running themes about the importance of reaching out to others. While Kakeru initially says they don’t need to get him any presents, when they ask again, he always has an idea for them. It can be hard for people to admit when they need or just plain want something (particularly if they’re part of a culture where they’re expected to put others’ perceived comfort above their own), which is why we sometimes need to keep asking and nudging a little, even over something fairly trivial like a birthday present. 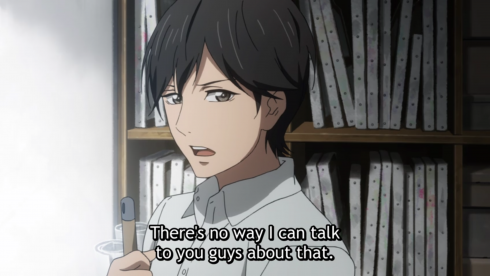 This episode is a roller coaster of joy and grief, and Kakeru’s birthday party provides the high point before the second act’s dive, as the gang celebrates his 17th and he finally tells Naho how he feels about her. 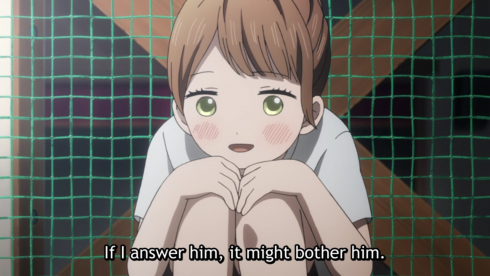 Naho doesn’t answer right away, although importantly her central conflict has shifted from “being afraid to act” to “wanting to act and not knowing the ‘right’ way to do it.” Her empty words to Kakeru last episode still weigh on her, and she doesn’t want to make that mistake again. Fortunately, Naho’s not working alone anymore. 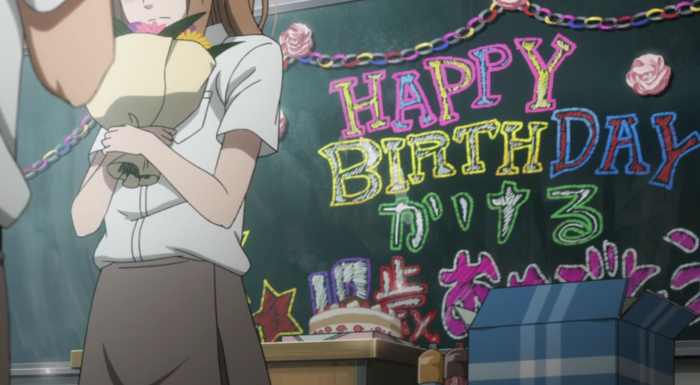 She and Suwa are sharing their letters (although Suwa left part of his at home, suggesting there may be details in there he doesn’t want even Naho see), which means they can literally compare notes about the future and work together to create happy memories like the birthday party and avoid painful ones that might push Kakeru further toward suicide. Right now, that means keeping him from talking to his callous friends from Tokyo, a meeting that likely sparked the first suicide attempt mentioned in their letters. 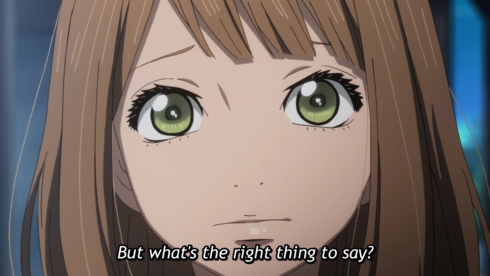 While Naho herself is definitely changing in this timeline, becoming braver and more open with others, the big difference between the world of the letters and the world of our story is a simple matter of knowledge: Naho and Suwa know Kakeru is suffering, so they can act on that in a way their other selves couldn’t. 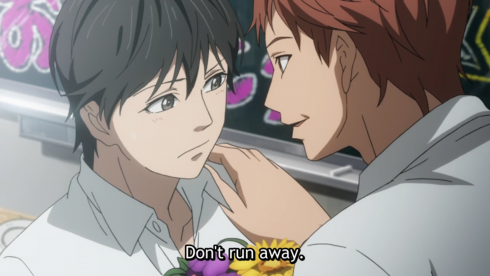 Which makes sense, given that Future Naho and Suwa both regret not “watching” or “looking after” Kakeru more. It’s less about what they didn’t do, but about what they didn’t notice. 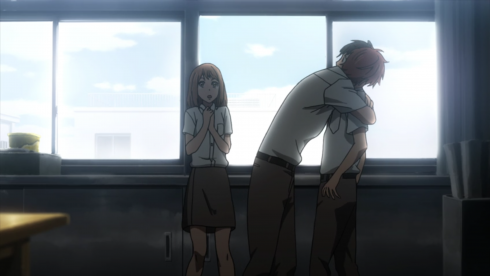 orange doesn’t blame the gang for Kakeru’s death anymore than it blames Kakeru for his mom’s, but it does acknowledge that small mistakes and little acts of thoughtlessness or fear can affect you and others more profoundly than you expect. In many ways the series is a plea to pay attention to the people around you, and to speak up when you’re worried–even if it’s embarrassing, even if you’re afraid of how they’ll react, and even if you don’t know the “right” thing is to say. The attempt at empathy and honesty is often more important than the actual words. 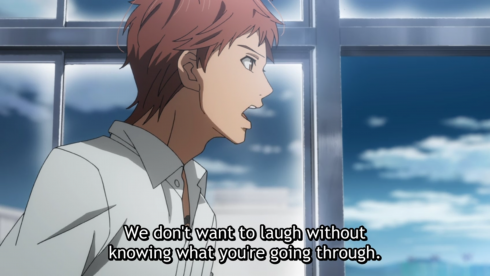 Suwa seems to know this intuitively: He acts almost without thinking, directly asking Kakeru if he’s ever wanted to die (“every day,” he says, and my heart shatters) and speaking exactly what’s on his mind. He insists Kakeru just acted “normally,” which is true, and that he “did nothing wrong,” which is… complicated. 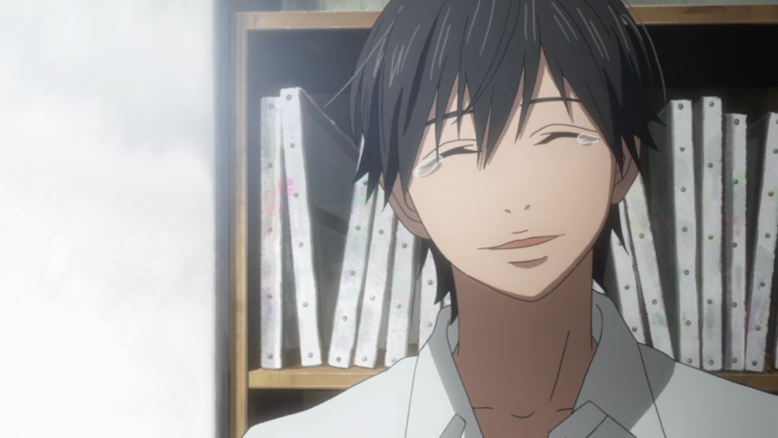 Kakeru did break his promise, but that doesn’t mean he’s a monster or that he’s to blame for his mom’s death. 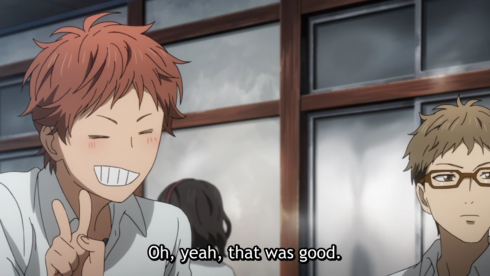 Coming to terms with both those truths will be tricky, and requires more than just absolving himself of all wrongdoing, something Suwa doesn’t quite get. 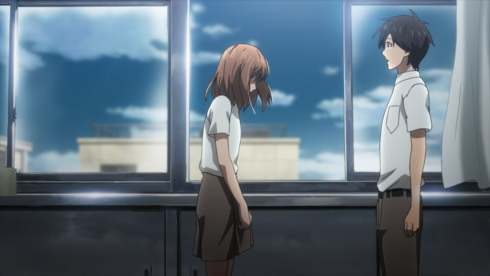 Even so, having someone say they’d have done the same thing (“I think that stuff’s a pain, too”) goes a long way toward moving from “I’m irredeemable garbage” to “I made a mistake.” More importantly, Suwa’s almost aggressive compassion opens the door for the more introverted Kakeru and Naho to speak up, simply and honestly, about how they feel. 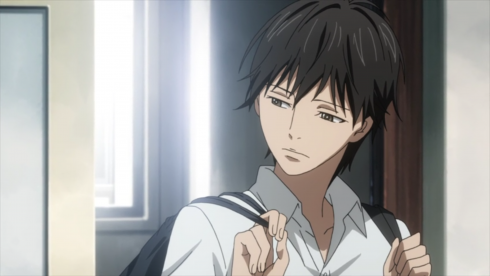 Kakeru hasn’t been “saved”–grief is a process and guilt a thousand needles you can’t pull out all at once–but he has, at least, been told that he matters. That there are people who want him around. And that, like every moment in orange, is a small but valuable step. If the Past Timeline is about preventing a tragedy, then the Future Timeline is more and more about finding closure after a tragedy. Each glimpse forward shows our adult cast trying to make peace with Kakeru’s death–answering questions, learning about their friend, repairing the bonds within their own group, and finding ways to do the things they weren’t able to do before. 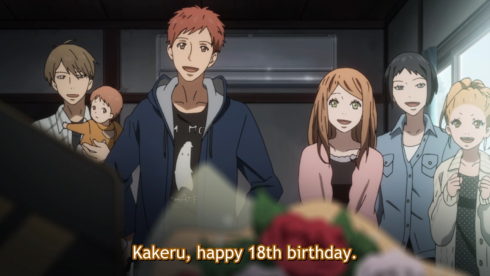 Celebrating Kakeru’s 18th birthday in front of his memorial is heartbreaking but also cathartic, as they’re finally able to give him the party and presents they couldn’t when they were in school. Our letter-writers may not be able to bring Kakeru back to their own timeline or completely erase their own regrets, but they can still find ways to come to terms with his suicide and heal the wounds in themselves and their relationships with each other. 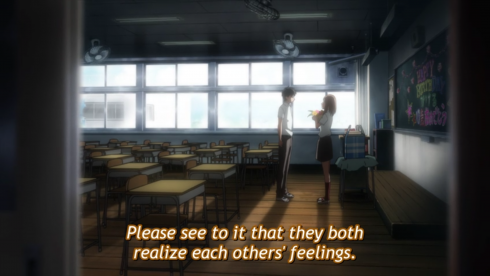 And, in doing so, they may be giving us a hint of what high school Naho and Suwa will likely have to help Kakeru himself find: A way to forgive himself, and a reason to move forward. Takako is a rock star. #BGSD, y’all. The Frog Saga Continues: Looks like “frog street” is a thing in Matsumoto. I still stand by my pun reading, but that makes their use in ads and festivals a more natural part of the setting, too. 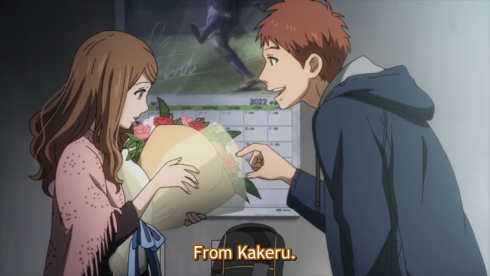 That brief memory of Kakeru’s mom tossing out his soccer bag after she pushed him to quit extracurriculars gives us a deeply concerning glimpse into their relationship, suggesting a codependency that wouldn’t be good for anyone, never mind a 16-year-old kid. I hesitate to call it full-on emotional abuse, but it certainly wasn’t healthy, that’s for sure. Future Gang and Past Gang get Kakeru the same presents even though Future Gang didn’t actually celebrate Kakeru’s birthday with him in their timeline, which always struck me as a little odd. I don’t have anything to add to that (although I do have a pet theory that I might talk about eventually), but I did want to note it as a curious coincidence.